You hear it all the time “unconventional this, unconventional that”, but what is unconventional? The definition of ‘unconventional’ is something not based on or conforming to what is generally done, and that’s exactly what these 24 unconventional kettlebell exercises are. They’ve been put together with the help of some awesome people like Steve Cotter, Valerie Pawlowski, Joe Daniels, Rik Brown, Kelly Manzone, Levi Markwardt and yours truly—Taco Fleur. I’m going to pick three of my favourites from the list and break them down for you, don’t worry, I’ll also give you a link to check them all out on Cavemantraining, but for now, lets focus on these three. I’ll be biased and pick 3 of my own. But I’m open to hear from you what your thoughts are, which three are your favourites from the list of 24, speak up and we’ll break a few more down for you. I invented the Kettlebell Noob Squat, I know that might sound cocky, and I’m not going to be offended if you think so, but I’m coming at this from the angle of; I’ve never seen it before; I’ve not heard the name before; Google doesn’t have anything on it, and trust me, I’ve done some serious research for our ultimate kettlebell grip ebook—which btw you can download for free from our website—that covers all kettlebell grips you can imagine. The Noob Grip is where the kettlebell is providing resistance from a completely different angle than you’re used to, it’s the complete opposite. I guarantee you that no matter how strong you think you are, this grip is going to challenge you because it’s an angle you’ve not been challenged from before. The reason I call this the Noob Grip is because I’ve been in the kettlebell game for over a decade and the first thing I see most Newbies do is grab the kettlebell with the bell resting on the inside of the arm. It’s weird when you see it, but then I started playing with it and realised that it’s time to use this, because if you implement the grip correctly, there is nothing wrong with it, in-fact, it’s a grip I recommend you include in your training if you want to get stronger. The next great thing is that it targets your biceps brachii from a different angle, in particular the long head of the biceps and the brachialis (the prime mover for elbow flexion). The kettlebell pulls towards the midline of the body, whereas conventional grips have the kettlebell balanced (efficient) or pulling laterally. Remember, for training you don’t always want efficiency, yes if your goal is endurance and reps during a comp or workout, no if you’re training. Cleaning a kettlebell for the Noob Grip is not something you’re going to be accustomed to right away, so first start with the assisted clean to get the kettlebell in the correct position, which is bell on the inside of the arm, handle resting on the heel of the thumb, you’ll need to make use of your fingers more to close the grip, and the rest of a conventional grip applies which will allow you to find a comfortable position. In the Noob Squat you obviously have a Noob Grip, and if you want the hardest version of this exercise—which I’m sure you do—then you need to have your forearms vertical and position the bells in such a way they’re not resting on anything. This position will challenge your biceps, brachialis, delts and lats. Because it’s still not difficult enough and we want full compound movements to get the biggest bang for our buck, we’re also adding the squat. I won’t go into full details on the squat as that’s a book on it’s own, but now we’ve also added the gluteus maximus, hamstrings, abdominals and quads, of course the erector spinea is always involved in anything upright with resistance, but even more so when the weight is out at the front or back. There is much more I could tell you about the Noob Squat, but I’ll leave it with that for now. Caution: even though this sounds like it could be an exercise for newbies, it’s not. I will categorise my second choice along the same lines as the Noob Squat, I’ve not seen someone else do it before, so you see it here first. Of course, the world is big and old, sure, someone, somewhere has done it before, I know, but I’m going to take claim and pretend no one has. For my project called Kettlebells in CrossFit I was looking for ways to improve barbell racking, hence I came up with the Open Palm Squat which besides looking super cool is also a super efficient way to increase your barbell racking mobility for CrossFit, much more so than using a barbell, and I’ll tell you why. It should also be said that although it’s great, it does not replace working with the barbell. The open palm clean, if not assisted, is more complex and comes with a steeper learning curve. Think of this as an assistance or mobility exercise for CrossFit, and as something cool in Kettlebell Training. To get into the open palm position you need to perform an open palm clean, this on it’s own will take you some time to master, you need to start with one kettlebell first. To perform the open palm clean you need to hold the handle in the middle, usually you hold it in the corner because of hand insert efficiency, but there is no hand insert with this clean, so instead, focus on getting the bell in a flat palm. You do this with a slightly more explosive swing, keeping the bell close to the body on the up-phase, slightly pulling upwards, if you get the trajectory right, the bell will flip over and land in your flat hand with the handle resting on the inside of your arm. Once you master one kettlebell, it’s time for two, once you have mastered two, add the squat. The great thing about the open palm squat, even if you’re not doing this for CrossFit, is that you’re working on wrist strength, shoulder stability (don’t let the bells rest on your shoulders), shoulder mobility and tricep plus lat flexibility. Add the squat… and you know the deal. Wow, just wow, all of this packed in one awesome unconventional exercise. Like I mentioned, the kettlebell bottoms-up squat would be my third choice, but I’d like to keep things as unconventional as possible, and although some of you might not have seen the double arm bottoms-up squat yet, I know it’s been done before, so without further ado… behold the Kettlebell Standing Pull-over. No, it’s not a Halo, let me get that out of the way right off the bat, although an awesome exercise, the Halo is creating a circular movement around the head, this one is creating more of an oval or direct line movement (depending on your flexibility) and works a lot more on thoracic and shoulder mobility, which is great for your overhead kettlebell work. 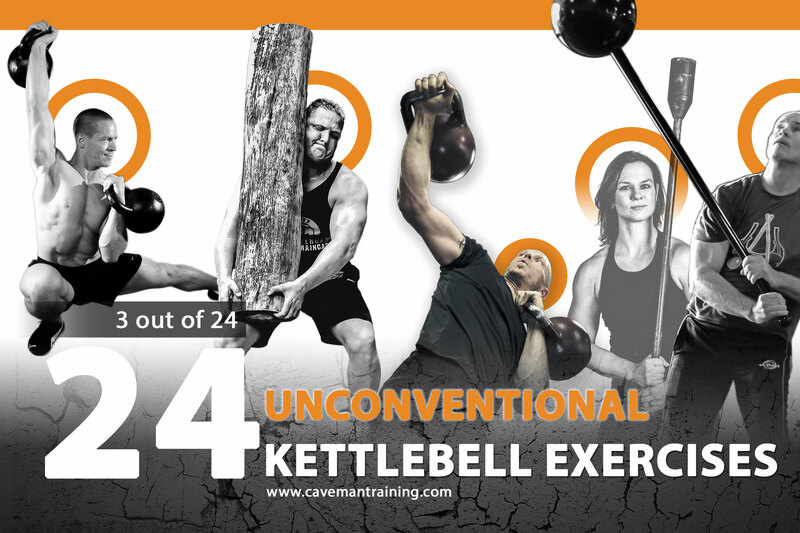 If you want to see what kettlebell exercises Steve Cotter, Kelly Manzone, Joe Daniels, Rik Brown, Levi Markwardt provided when I asked them for their favourite unconventional kettlebell exercise, then check out the link below and see what the other 21 are. Remember, we love hearing from you, post your feedback, comments below or on this Facebook post here. Don’t forget to mention your three favourite unconventional kettlebell exercises, or any unconventional exercise. Give us a thumbs up if you enjoyed these 3 unconventional exercises and want to see more. Taco Fleur is the owner of Cavemantraining, a long time kettlebell enthusiast and certified as IKFF CKT Level 1, Kettlebell Level 1 & 2 Trainer, Kettlebell Science and Application, CrossFit Level 1 Trainer, MMA Conditioning Level 1, MMA Fitness Level 1 & 2 and more. Taco organises amazing fitness getaways in Spain with guest appearances or education from high profile kettlebell trainers, catering to individuals and personal trainers. Taco provides kettlebell education online and in person. Taco has also published three books on Amazon, the last one being the ultimate guide to kettlebell pressing, called Master The Kettlebell Press, which he has written together with Joe Daniels. It’s safe to say that there simply is no other book which breaks down the press and covers all possible press variations you can imagine. You can buy the book from Amazon as kindle or paperback edition, simply search for ‘Master The Kettlebell Press’ in Google or Amazon. Last but not least, Taco has put it upon himself to head up the Kettlebells in CrossFit Project which has the purpose of introducing more kettlebell work in CrossFit, as every box has kettlebells but don’t really use them to their full potential. Following is the audio recording of the article on Podbean and Youtube.